"We're Leeds United, we spy where we want." A Leeds United fan came dressed as a spy for the 2-0 win over Derby County in Friday night’s Championship match at Elland Road. 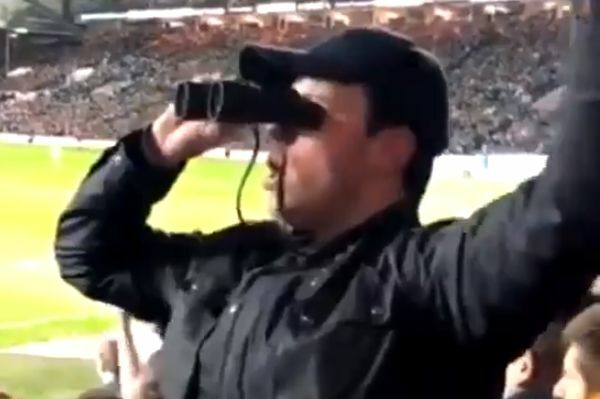 The supporter wore a dark jacket and looked at the away end through binoculars in reference to an incident at Derby’s training ground on Thursday. Officers were called from the Derbyshire Constabulary at 11.20am “following reports of a man acting suspiciously outside the premises”. And Leeds fans had fun with the alleged intelligence-gathering, chanting “we’re Leeds United, we spy where we want”. Goals from Kemar Roofe and Jack Harrison earned a win that took Marcelo Bielsa’s side five points clear at the top of the Championship. Bielsa has since admitted to sending a spy to Derby’s training ground and accepts all responsibility.